I'd always wanted to see the view from White Provision. Thanks to Denise Jackson and her Emerging Art Scene and White Provision we can. Among many other things, Denise puts on events that feature art, food and tours. 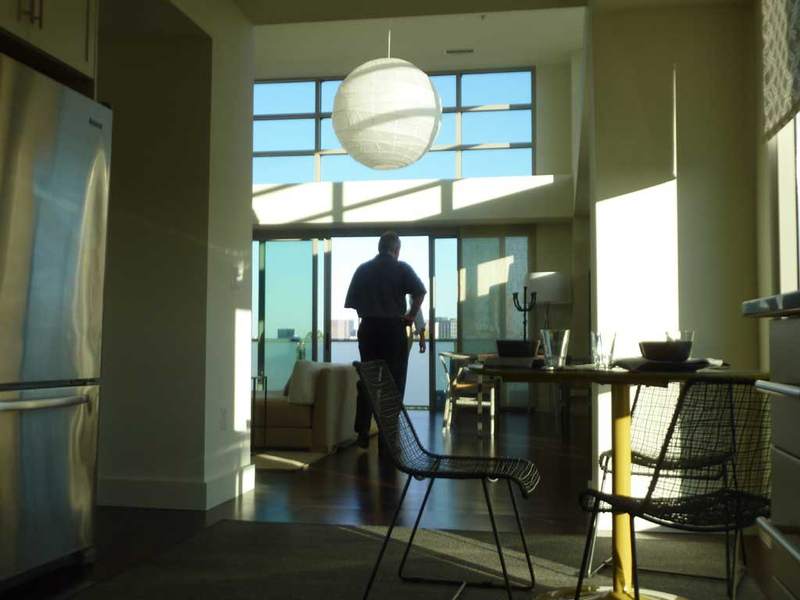 This is what it's like to enter the southern most penthouse. It's on a corner with windows on 3 sides, balconies on 2 sides. 40 seconds. Here is a tour from the guest room to the master. This is the panorama from the east facing penthouse, just amazing. I'm afraid your cameraman has to work to do on steadiness. It was wonderful to meet Lance Carlson who is not only an artist, not only an architect/partner at Carlson & Mosley Architects, he reads the blog. And I know he really reads it because he answered the secret question. 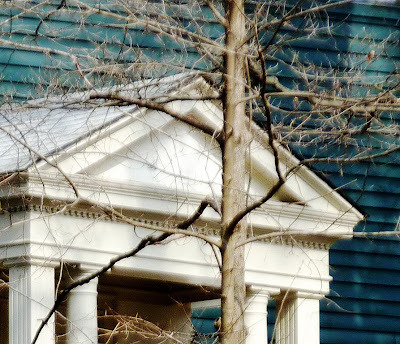 Thanks so much to Eileen Drennen who wrote about this blog in the Virginia Highland-Druid Hills Patch: "Seeing the wonder of everyday views with a local 'Architecture Tourist.'" Now we return to our regularly scheduled blog post already in progress. Neel Reid did it too, applying classic detailing is in unexpected places to produce delightful results. I've shown you this one before in "Neoclassical Erratics in Decatur and Druid Hills." It's a temple fronting a modern with green clapboards. A temple in the woods on a gravel path, it's ancient on modern, high style on rustic. Thanks to Atlanta Preservation Center's Buckhead in Bloom 2011 I toured the 1922 "Street House" by Neel Reid. It does does the same sort of thing don't you think? It's a temple on gray-green shingles in the woods at the end of a gravel path. There is no mistaking one for the other. The formal Palladian entrance is refinement dialed to 11. Yet my eye reads as a cottage in the woods. Let's call it a big refined cottage. Just look at the size of those triple-hung windows. The modern is going on sale soon. I hope I can visit. Architecture Tourists love bunnies and cake and Easter and family and springtime in Atlanta. So we revived an ancient tradition here at North American HQ. We summoned our in-house Bunny Cake Boss and 2 of our senior architecture tourist bunny consultants and cake counselors. I guess y'all want to skip to the last page to see how it all come out. Easter dinner on the porch: stewed chicken, dumplings, mashed potatoes (we were heavy on the white food group), deviled eggs, green beans, salad, with snarky but loving conversation. Considering the world crises of poorly sliced layers, improperly dyed coconut, and misplaced jellybeans, and misaligned twizzlers, our executive board, by secret ballot, agreed to reveal how to make a proper bunny cake. Recipe? We don' need no stinkin' recipe. But y'all might. Click here to see the whole show. I confess we were a little rusty. There were some close calls. Here's a preview of the bunny ear positioning tutorial. Our vast experience helped avert a semi-sweet chocolate morsel adhesion emergency. It was close call but the Bunny Cake Boss made it look easy. Our experts chimed in on the cosmetics. 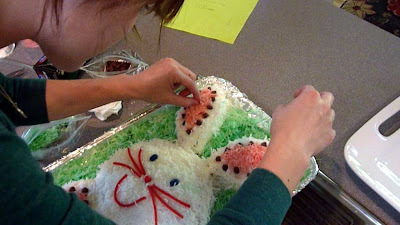 Our Bunny Cake Boss has limited openings for the 2012 season (by appointment only) Substantial deposit required. The menfolk roared their appreciation. Now the team is in training for flag cake season. My little tour of the Hapeville Historic District started with the two churches. 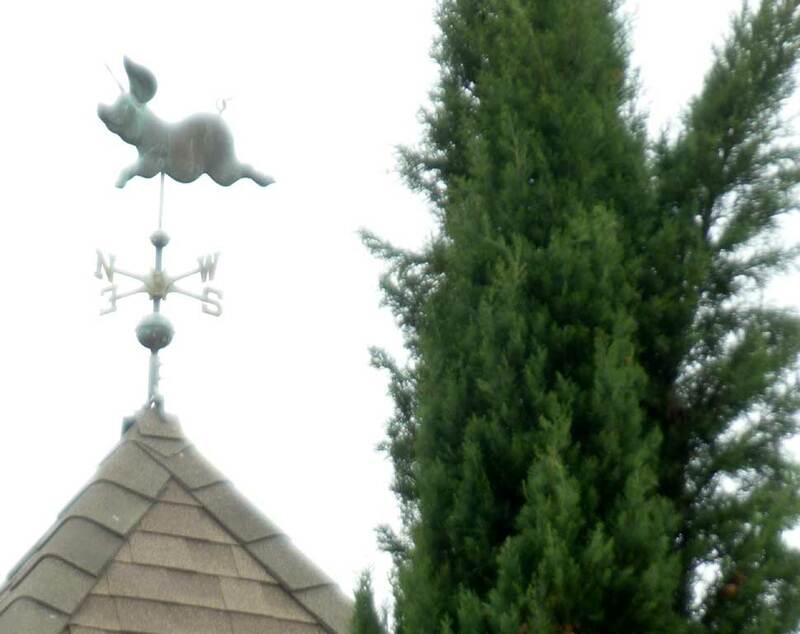 I continued with a fortuitous street meeting with floral designer Al Dellinger, then a B&B's jaunty weather-vane, and a finally chapel on the move. Hapeville was a street car suburb, site of Georgia Baptist Children's Home from 1899 to 1968. It's south edge was consumed by the world's busiest airport and a Ford Assembly Plant. Somehow it retains it's small town character, including an active main street. Look at this sidewalk on a tiny side street. I don't know of another like this in Atlanta. It's just one house wide and seems like a park. Two columns, no, three, wow. Good grief, there is a house in this garden. I noticed a man walking his dog. I'm sure he noticed me looking out of place and bearing a camera. I asked if he knew anything about the house. He said, "It's mine," and invited me in. That's how I met Al Dellinger who with partner Tim Thomas own 2000 A.D Inc. "Concepts in Floral Art." Al's a transplant from Midtown who thinks Hapeville is a bargain that will attract folks who now enjoy Atlanta's intown "South of Buckhead" neighborhoods. I was overwhelmed by the hospitality and the house. It's circa 1895, nearly demolished, sold at one time for $5000, a bit ghost-y too. It's as if I'd discovered a long lost temple in the jungle. Indeed I had, and a friendly guide to boot. Al said the the "new" porch replaced a lot of gingerbread. Inside? I'll just show you a little glass. 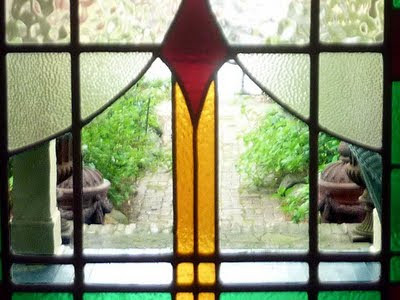 This is the garden from the foyer. Next up is Maison LaVigne, Hapville's "Gourmet Bed & Breakfast" just a few steps from the Hapeville Depot. Folks MUST be pretty good at keeping secrets. Did everybody have know about this place except me? I don't think this is all original equipment from 1920. I swooned over the sideyard, that blue, the chunky window lentils, shutters, flower-boxes, curvy fence and rustic furniture. Finally, Hapeville's Historic Christ Church (c. 1895) has just finished it's second move. It's now a terminal vista for 19/41 South. It's the perfect complement for an old Chevy. It arrived here in July 2010. I think they've nearly completed upgrades in it's new location. I'm looking forward to seeing the inside. Update 20-4-11: I've found a 1954 picture with the portico of Hapeville Baptist Church's "old stone church" and a 1954 picture showing different columns and capitals at Hapeville First United Methodist in the collection of Kenan Research Center, Atlanta History Center. These little unexpected discoveries are delightful. Hapeville Georgia is where the airport is and the Ford plant was. Comedian Jeff Foxworthy was raised here, and graduated from Hapeville High School. Hapeville, Decatur, East Point, and College Park retain their small town identity inside the perimeter. On the way home from delivering Daughter #1 to the airport, I took a brief architecture tour of downtown Hapevile. I found a 1929 Heinz, Adler, & Schutze. It's the Hapeville United Methodist Church originally designed in 1909 by minister-architect Charles Edward Choate. I'd never heard of Choate. First Methodist faces into it's park-like front yard. It's amazingly peaceful just half a mile from the runways. From First Methodist's portico, you can see the "old stone church" built from Stone Mountain granite in 1923, the first Sanctuary of Hapeville First Baptist Church. It's been re-purposed but I find it as irresistible as a ruin. Where are the windows and portico now? Update: picture with the portico of the Hapeville Baptist Church's "old stone church. This is the 1964 sanctuary, a white ground-level beauty. The education building blends old and new, stone and brick, with a bit of classical detailing. Well I've run out of space. More about this window in the next post.